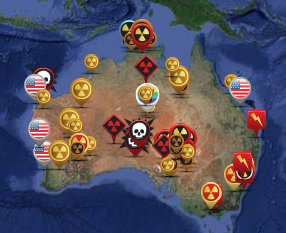 On the 19th March 2015, the South Australian Government initiated a Royal Commission looking for opportunities to improve the state’s economy by expanding the nuclear industry. The panel is stacked with pro-nuclear people and the terms of reference largely ignored the history of radioactive racism that has seen atomic testing, uranium mining and proposals for the dumping of nuclear waste impact the physical and cultural health of communities. A hugely successful campaign led by the Kupa Piti Kungka Juta, Senior Aboriginal Women, against the impostion of a national nuclear waste dump between 1998 and 2004 saw the state introduce legislation that makes it illegal to dispose of nuclear waste in South Australia. (Nuclear Waste Storage Facility (Prohibition) Act 2000).